The minuscule and the immense can reveal quite a bit about each other. In particle physics, scientists study the properties of the smallest bits of matter and how they interact. Another branch of physics—astrophysics—creates and tests theories about what’s happening across our vast universe. While particle physics and astrophysics appear to focus on opposite ends of a spectrum, scientists in the two fields actually depend on one another. Several current lines of inquiry link the very large to the very small. 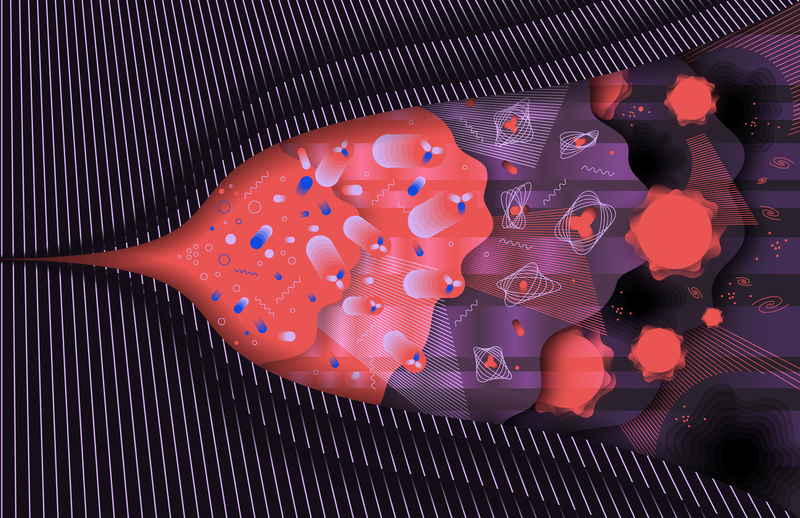 For one, particle physicists and astrophysicists both ask questions about the growth of the early universe. In her office at Stanford University, Eva Silverstein explains her work parsing the mathematical details of the fastest period of that growth, called cosmic inflation. Scientists think that after the Big Bang, the universe cooled, and particles began to combine into hydrogen atoms. This process released previously trapped photons—elementary particles of light. The glow from that light, called the cosmic microwave background, lingers in the sky today. Scientists measure different characteristics of the cosmic microwave background to learn more about what happened in those first moments after the Big Bang. According to scientists’ models, a pattern that first formed on the subatomic level eventually became the underpinning of the structure of the entire universe. Places that were dense with subatomic particles—or even just virtual fluctuations of subatomic particles—attracted more and more matter. As the universe grew, these areas of density became the locations where galaxies and galaxy clusters formed. The very small grew up to be the very large. Particle physicists and astrophysicists both think about dark matter and dark energy. Astrophysicists want to know what made up the early universe and what makes up our universe today. Particle physicists want to know whether there are undiscovered particles and forces out there for the finding. There is strong evidence for dark matter through its gravitational effects on ordinary matter in galaxies and clusters. These observations indicate that the universe is made up of roughly 5 percent normal matter, 25 percent dark matter and 70 percent dark energy. But to date, scientists have not directly observed dark energy or dark matter. But scientists have powerful tools to try to understand some of these unknowns. Over the past several years, the number of models of dark matter has been expanding, along with the number of ways to detect it, says Tom Rizzo, a senior scientist at SLAC and head of the theory group. Some experiments search for direct evidence of a dark matter particle colliding with a matter particle in a detector. Others look for indirect evidence of dark matter particles interfering in other processes or hiding in the cosmic microwave background. If dark matter has the right properties, scientists could potentially create it in a particle accelerator such as the Large Hadron Collider. Physicists are also actively hunting for signs of dark energy. It is possible to measure the properties of dark energy by observing the motion of clusters of galaxies at the largest distances that we can see in the universe. Particle physicists and astrophysicists find their interests also align in the study of gravity. For particle physicists, gravity is the one basic force of nature that the Standard Model does not quite explain. Astrophysicists want to understand the important role gravity played and continues to play in the formation of the universe. In the Standard Model, each force has what’s called a force-carrier particle or a boson. Electromagnetism has photons. The strong force has gluons. The weak force has W and Z bosons. When particles interact through a force, they exchange these force-carriers, transferring small amounts of information called quanta, which scientists describe through quantum mechanics. General relativity explains how the gravitational force works on large scales: Earth pulls on our own bodies, and planetary objects pull on each other. But it is not understood how gravity is transmitted by quantum particles. Discovering a subatomic force-carrier particle for gravity would help explain how gravity works on small scales and inform a quantum theory of gravity that would connect general relativity and quantum mechanics. Compared to the other fundamental forces, gravity interacts with matter very weakly, but the strength of the interaction quickly becomes larger with higher energies. Theorists predict that at high enough energies, such as those seen in the early universe, quantum gravity effects are as strong as the other forces. Gravity played an essential role in transferring the small-scale pattern of the cosmic microwave background into the large-scale pattern of our universe today. Physicists are modeling gravity over lengthy time scales in an effort to reveal these effects. Our understanding of gravity is also key in the search for dark matter. Some scientists think that dark matter does not actually exist; they say the evidence we’ve found so far is actually just a sign that we don’t fully understand the force of gravity. Learning more about gravity could tell us about the dark universe, which could also reveal new insight into how structure in the universe first formed. Scientists are trying to “close the loop” between particle physics and the early universe, Peskin says. As scientists probe space and go back further in time, they can learn more about the rules that govern physics at high energies, which also tells us something about the smallest components of our world. Artwork for this article is available as a printable poster.